The very brave and honest friend of presumptive president Rodrigo Duterte was named as his Agriculture Secretary. The former North Cotabato governor Manny Piñol appointed by President Rody as Agri Secretary in the incoming Duterte's administration. And because of the good news for him, sir Manny immediately shared the wonderful moment of his life through his official Facebook account. He created a post with the titled, "AVAILABLE, AFFORDABLE FOOD; NO CORRUPTION IN AGRI DEPT." Manny Piñol is also a columnist and radio broadcaster. He storied the scene and here's what happened. NO CORRUPTION IN AGRI DEPT. I have to admit that it took sometime before the realisation that I had been named by President-elect Rody Duterte as his Agriculture Secretary sank in. I actually did not have an appointment with the incoming President like the others but Senator Alan Peter Cayetano who accompanied the delegation from Cavite asked me to join the group in saying "Hi" to PresidenteRody. The group sat in front of PresidenteRody while I and his trusted executive assistant, Bong Go, were engaged in a conversation. Just as the group was about to leave, PresidenteRody asked me to join former Congresswoman Andrea "Didi" Domingo in standing beside him. Then he pointed to Didi Domingo as the incoming Chairperson of PAGCOR or the Philippine Amusements and Gaming Corp. Suddenly he said: "And meet the new Secretary of Agriculture, former Governor Manny Piñol." While I did not lobby for the position, I would be lying if I said that I was not happy with the appointment. Deep inside me, I told myself: "Wow, now I will be able to do what I had long wanted our agriculture officials to do which is to produce more food for the Filipinos and improve the lives of our farmers." 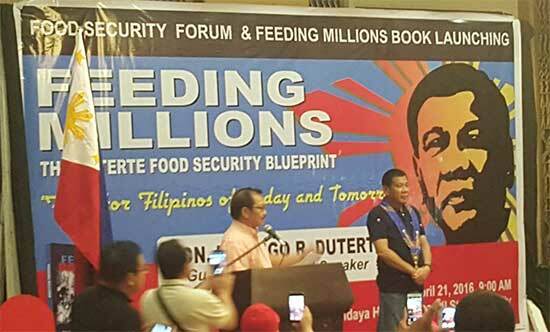 His marching orders were very clear: "Ensure available and affordable food for the Filipinos," and "No Corruption in the DA." The task is gargantuan. It is not going to be easy to produce food for 105-million Filipinos. I pray to God to give me strength so I would live up to the expectation of the new President and the Filipino people. There will be sacrifices to be made like leaving my farm again to the care of people who have worked with me for so long and not seeing my chicken and plants everyday. The thought, however, that I will be able to implement PresidenteRody's vision in agriculture and food security is worth all the sacrifices. Work starts today with a meeting with the representatives of the United Nations World Food Program. After this, I will silently move around the country to get the feel of the situation so that on Day One, the Change that PresidenteRody promised with start. Thank you for the prayers but please say more prayers because the task ahead is daunting and the temptations will be aplenty. What do you think on the appointment job to sir Manny? Please point out your thoughts in the comment section below. Comments or suggestions about "Manny Piñol appointed as 'Agriculture Secretary' by President Rody" is important to us, you may share it by using the comment box below.